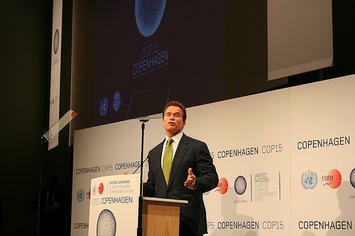 Copenhagen wasn’t meant to be just another UNFCCC meeting. It was the Conference of Participants (the Convention’s supreme body) where member nations were to sign off on a successor to Kyoto, which only covers the period to 2012. Their failure to do so means the process is in disarray. Consisting of twelve short clauses, the Accord is little more than a face-saving device full of vague and unenforceable aspirations. The final clause calls “for an assessment of the implementation of this Accord to be completed by 2015”, so the world won’t have a binding operational treaty for some time, if ever. Of course, individuals, firms and organizations in the private sector are always entitled to act on their own initiative, should they feel strongly about the issue. There just isn’t a rationale, or moral justification, for coercive state action. As John Humphreys of the Centre for Independent Studies points out, “it is an indication of the sorry state of community groups that when faced with a problem, they spend millions of dollars whingeing and asking other people to do something“. He proposes that “instead of whinging and waiting for politicians to become benevolent, people who are worried about anthropogenic global warming can take immediate action”. Climate activists and concerned citizens should put their money where their mouths are. On a practical level, Humphreys estimates that if activists were to organise a system of voluntary “workplace giving”, whereby people could opt to allow 0.5 per cent (or more) of their income to go directly into a “climate fighting fund“, more that $1 billion would be raised if only one third of Australians participated. These funds could be used to buy low-emission energy from alternative energy producers for sale to into the power grid at the going market price. For one thing, this would spur investment in alternative energy technologies without inefficient meddling from government. This is one of many courses open to those who profess to be alarmed about the coming cataclysm. We’re often told they’re in the majority. Since the future of the planet is at stake, why should higher contributions matter? If green activists and entrepreneurs can generate demand for expensive but clean energy sources, the government should facilitate this market by removing barriers to entry, not by mandating or subsidising particular energy options. If property developers can generate demand for high-density “green” housing, planning officials shouldn’t regulate against this, just as they shouldn’t regulate against low-density housing. The same applies to transport and cars. Let consumers choose. This is the real “market solution” to climate change (assuming a solution is needed), not the fake market represented by a cap-and-trade ETS. Surveys and electoral returns show that the affluent tend to be more concerned about green issues, so this approach has an added advantage. It relieves wealthy greens of the moral hypocrisy inherent in demanding state interventions which produce glittering opportunities for them, while shifting the pain disproportionately to the most vulnerable in the community. Submitted by WernerPatels on Wed, 01/20/2010 - 16:45. When it comes to climate change, one can identify four groups of people. Those who are genuinely concerned about the health of their planet based on the scientific evidence they have seen. Those who have jumped on the bandwagon of global warming to promote an ideology of wealth redistribution, without actually caring about the environment. Those who discard the whole idea of climate change on purely ideological grounds. And, finally, those who disagree with the theory of man-made global warming based on the scientific they have seen. Which group is right? Which one gets it all wrong? No one can answer that, not with the evidence there is for and against climate change at this time. All anyone can say with certainty is that there is a change afoot, but what its causes are is far from “settled science”. For every scientist who says climate change is man-made, one can find at least one other reputable scientist to say the exact opposite. If “climate change denial” were a criminal offence, all those charged with such “crime” would have to be acquitted now in the wake of the Climategate e-mails, which, at the very least, constitute (more than) reasonable doubt. The most recent fallout from Climategate concerns Rajendra Pachauri, head of the Intergovernmental Panel on Climate Change (IPCC) and purveyor of the theory that the Himalayan glaciers are melting. His claims have been refuted by the Indian government. As well, the Times of London has found that his claims were not based on science at all, but only speculation. The truth, as always, is probably found somewhere in the middle of all those positions. But what the world needs is facts and proper inquiry, not a growing mountain of reasonable doubt. With most countries around the world now prepared to cause considerable damage to their national and global economies in what they have been led to believe is a fight for survival, it is absolutely crucial that all the facts be available and that they have been proved beyond any reasonable doubt whatsoever. Both the IPCC and the British university involved in the Climategate affair have done more than any “denier” ever could to discredit their own views. Therefore, the world deserves a fresh start, and this time world governments must take every conceivable precaution in selecting reliable and ethical scientists who can be relied on to conduct actual scientific research into climate change without any ideological baggage or bias. Submitted by jv99 on Mon, 01/18/2010 - 13:01. I do hope you are correct, that world government and climate change nonsense are down for the count. Like any good vampire hunter I want to see the body, though . . . . The real issue is overpopulation. And that will only get worse and worse. You only have to look at Haiti to see the effects of a large population, large beyond available resources, and world, in this case US puppet government, running a nation to see the future. Replacing carbon energy is desirable because it is a depleting resource and is dirty in ways other than CO2. But "alternative energy" is not scaleable and requires massive investment in infrastructure to work - land, water, power lines, metals, chemicals, etc. Long and large subsidies are what is required and was one argument for a carbon tax. Without the cash for subsidies it has to compete with health care, debt service, other infrastructure, defense, medicare, etc., etc. for investment support to get going. VCs won't invest in it until that happens and "guys in a garage" can't bootstrap $1B of land or power line costs to run their machines with either. Coal, natural gas, and oil are here for a long time to come.